Today was a big day for the street interpreters in Barkerville. Today we made a little bit of history as we took the stage at the Theatre Royal for the first official and fully-realized street/theatre crossover. For more than a decade now, Newman & Wright Theatre Company has graced Barkerville with musical variety shows and historical dramas that have provided world-class entertainment at the Theatre Royal throughout Barkerville’s five-month summer season. For six days out of every week, the theatre rings with songs and stories performed by this immensely talented troupe and its crew. But what happens on the seventh day? As amazing as our Theatre Royal cast is, no one can be expected to work seven days a week for five months straight without seriously hurting themselves. On Thursdays, Newman & Wright Theatre Company gets a well-deserved day off. In the world of live theatre a day of the week with no show is called a “dark day.” For many years there was a traditional dark day at the Theatre Royal, but for the past few years that dark day has been replaced by some alternative entertainment offering, in order to provide uninterrupted theatrical experiences for our visitors no matter what day of the week the choose to visit Barkerville. We often fill the Thursday slot with solo shows – one person comedic, dramatic or historical pieces. In fact, for the past two seasons my own solo shows, The Bride of Barkerville and Lady Overlander, have covered Thursdays at the Theatre Royal. This season, however, I am back on the street full-time as an historical interpreter, so I wasn’t able to take up the Thursday challenge. Not all by myself, at least. This past spring Barkerville had an idea. We wondered if, in the grand tradition of the original Cariboo Amateur Dramatic Association, it would be possible to fill the Theatre Royal with entertainment brought to the residents and guests of Barkerville straight from the streets themselves. In 1865 Miss Florence Wilson (the documented historical character I have played since 1993) joined Mrs. Catherine Parker, Mr. John Bowron, and a handful of Barkerville’s more prominent citizens to produce ‘amateur theatricals’ that they performed regularly in the Parlour Saloon. The Cariboo Sentinel newspaper, which ran its presses on Williams Creek from 1865 to 1875, is peppered with references to the Cariboo Amateur Dramatic Association, which clearly grew into a beloved and relied upon fixture of the social fabric of the original Cariboo gold rush. Eventually, the CADA helped to build the Theatre Royal itself, as a joint venture between the Dramatic Association and the Williams Creek Fire Brigade, in the aftermath of the Barkerville’s great fire of 1868. Live entertainment on the stage at the new theatre consisted of travelling professional troupes as well as the local community players. Since 2013, Newman & Wright Theatre Company has presented its daily musical variety shows at the Theatre Royal under the ingenious pretext of a documented Victorian travelling company called LaFont and Ward’s Troupe. It made sense to us, then, that on Newman & Wright’s dark day the street interpreters of Barkerville should move into the theatre – not as ourselves but as our street characters, many of whom were CADA members in their day – to provide an hour of light-hearted fun and frivolity invoking the essence of the what the original Cariboo Amateurs might have produced for the people of Williams Creek who were hungry for some diversion from their long and arduous work days. To say we had jitters today – our opening day – is a bit of an understatement. Barkerville’s street interpreters are seasoned professional actors, but now we presented ourselves with a unique new challenge: we would be engaged in a play within a play. Our interactive street presentations are themselves fairly complex undertakings, but now we would take our interpreted historical street characters and apply them to an unfamiliar format. We would be flinging our miners and merchants and Cariboo legends (even ‘Billy Barker’ himself is part of the show) onto the stage of the Theatre Royal to sing and joke and act in ways we seldom get a chance to experience during our regularly scheduled daily programming. As we took the stage today at one o’clock I will freely admit to being uncharacteristically nervous… but the show must go on, as they say, and it did. Our new production, Billy Barker’s Hour of Vaudeville and Frivolity, played to a warm and welcoming house of rain-soaked visitors who had been pounded all morning by this week’s record-breaking BC storms. Several members of Newman & Wright’s six-days-per-week cast were in the audience – having ventured into Barkerville on their one and only day off in a remarkable gesture of support – and it was all so much fun. For the first time in a very long time the ‘townsfolk’ of Barkerville were strutting their stuff onstage at the Theatre Royal, and we are now so very proud to stand alongside Newman & Wright Theatre Company as part of the creative team bringing live performance to our beloved theatre seven days a week from now through September. 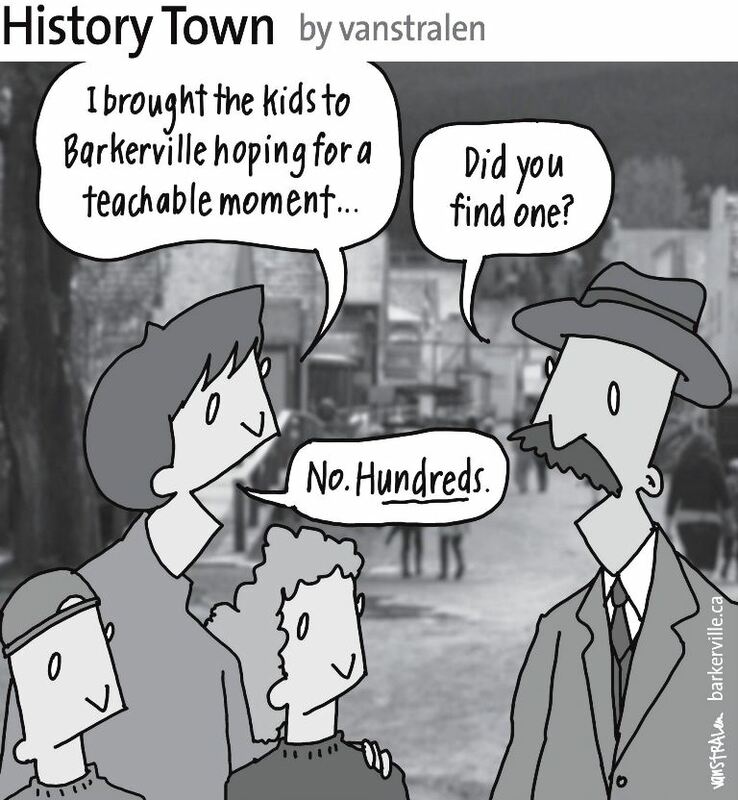 The above one-panel cartoon (originally published July 26, 2014) by Dirk Van Stralen, with accompanying editorial by Danette Boucher, is the eleventh of twenty weekly entries that were logged – and subsequently blogged – as part of a 2014 collaboration between Barkerville, British Columbia and the Prince George Citizen aimed at introducing some of the quirkier advantages to living, working, and playing in the Cariboo Goldfields. We hope you enjoy! Wonderful idea to make full use of those unique and loveable characters and . . . Dang we missed it this year.